At John McLellan & Co our Chapel of Rest is an intimate and comfortable room, which is available for the family to sit and spend time with their loved one. If you wish we can have soft music playing which is just enough to hear, but not too loud to intrude. The lighting is subdued and candles are lit, so that the bereaved have time for quiet reflection and privacy. The Chapel is also designed so that there can be a small intimate service with your chosen minister, priest, humanist or friend. On request, a hymn or special piece of music can be sung or played during the service, and readings or any special requests can be included throughout. 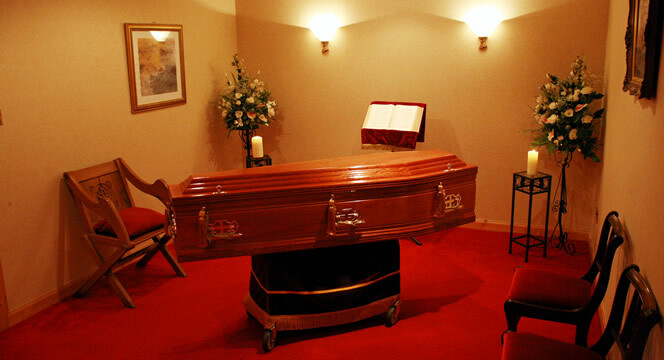 The service is unique to each individual and personalises in a very special way the bereaved’s life. This Chapel can seat up to 30 people for funeral services.